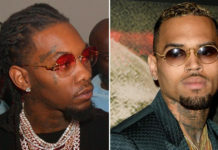 Young R&B singer/songwriter Chris Brown, most notably the biggest act of the night, stole the show Tuesday night (Oct 27) in East Rutherford, New Jersey at the Izod Center as he performed for thousands of people during Power 105.1’s Powerhouse concert. 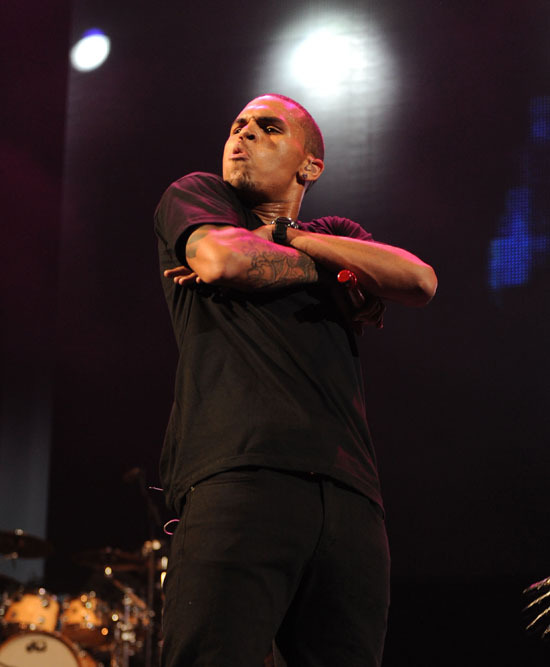 This marked Chris Brown’s FIRST major performance in over 8 months! And according to reports? Dude killed it! And the crowd loved it, which is great to hear considering all he’s been through the past year. 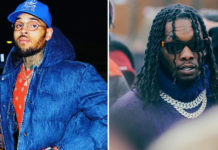 There was an immediate roar in the crowd as Brown came out in a black-and-red jacket that looked like a futuristic version of what Michael Jackson wore in the “Thriller” video. 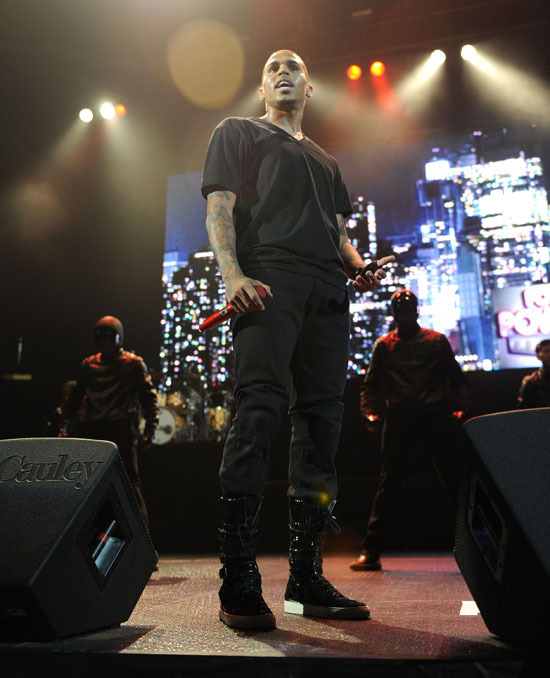 Brown wasted no time in getting to his new material, starting with “I Can Transform Ya.” Chris began at the back of the stage with his dancers, who were all dressed in black up to their face-covering motorcycle helmets. 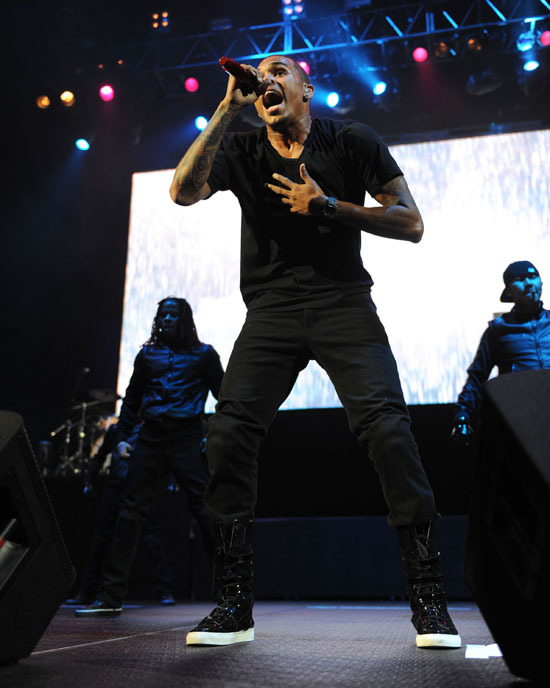 Brown started singing and walking to the front of the stage, where Swizz Beatz also emerged to rap the song’s hook. “Wall to Wall” followed, with more high-powered dancing. In the middle of the record, Brown’s DJ played Jay-Z’s “On to the Next” during a choreographed breakdown. Leg kicks, krumping, slides — Brown’s arsenal seems to have expanded. 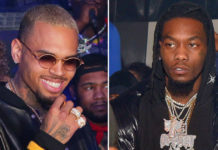 “Gimme That” was next, and Brown reminded the crowd that he’s getting older on the opening lyric: “The young boy now is 20.” Shortly after, Brown’s DJ asked him how he felt. The singer let the music speak for him as the Clipse’s “I’m Good” came on. “Are y’all glad Chris is back doing shows?” Brown’s DJ asked the audience. The fans screamed with praise. Brown finally spent some time speaking to the audience after they sang Jordin Sparks’ parts on “No Air.” “Despite my past and stuff like that, I appreciate all of y’all,” he said. His words were barely audible because of the cheering. The singer also promised to be a better man. “How long we gonna do this for? We gonna do this forever!” he also promised. Of course, “Forever” closed the show.